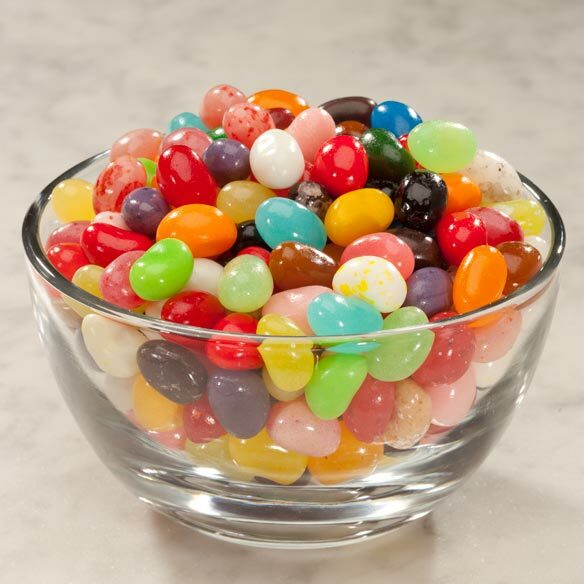 Discover 41 reasons why these gourmet jelly beans are true American treasures! In its 4th generation since 1898, the family-owned Gimbal Candy Kitchen remains passionate about making delectable treats, and these gourmet jelly beans burst with pure goodness—FREE of peanuts, dairy, eggs, gluten, soy, trans fats and gelatin. 41 flavors include Buttered Popcorn, French Vanilla, Tiramisu, Tutti Frutti, Roasted Marshmallow, Ice Cream Cake and more. 40 oz. Sugar, Corn Syrup, Food Starch Modified, Dextrose,Apple Juice Concentrate, Natural and Artificial Flavors, Chocolate Liquor, Honey, Cocoa Powder, Color Added, Red 40 Lake, Red 40, Blue 1, Blue 1 Lake, Blue 2 Lake, Yellow 5, Yellow 5 Lake, Yellow 6,Yellow 6 Lake, Citric Acid, Malic Acid, Ascorbic Acid, Sodium Citrate, Confectioner's Glaze, Carnauba Wax, Beeswax. 41 FLAVORS: Blueberry, Boysenberry, Bubblegum, Buttered Popcorn, Coconut, Cotton Candy, Green Apple, Ice Cream Cake, Key Lime, Lemon Meringue, Licorice, Mango, Perfectly Pear, Pink Grapefruit, Pomegranate, Sour Cherry, Spicy Cinnamon, Strawberry Cheesecake, Tangerine, Verry Blue, Watermelon, Wild Cherry, Baja Margarita, French Vanilla, Fruit Punch, Honey, Java, Kiwi Strawberry Smoothie, Orange 'n Crème, Peach, Pina Colada, Pineapple, Raspberry, Red Delicious, Roasted Marshmallow, Rootbeer, Strawberry Daiquiri, Superfruit Fusion, Tiramisu, Tutti Frutti, WOW! Chocolate. Wow! These things were awesome! Flavors were spot on! Best Bargain in town on JB's! Pick out a specific flavor to savor or grab a handful and enjoy the mixture. Make your own flavors by the handful! Flavors of the jelly beans are outstanding. I tried separating by colors for one taste, but then I'd take a handful of different ones & make a new flavor. Delicious! How many jellybeans in this jar? THEY ARE VERY SIMILAR TO THE JELLY BELLY, AND BETTER PRICE.I ALWAYS NEED SOME SWEET CAUSE MY MEDICINES CAUSE A BITTER TASTE IN THE MOUTH ALL DAY, AND THESE ARE GOOD ENOUGH.ONLY I WISH THEY SELL INDIVIDUAL FLAVORS TO SELECT. These are so flavorful and they aren't hard like so many you purchase online are!! These are my favorite jelly bean........even if they are a bit pricey!!! Worth every cent!!! My husband loves these so much, I kind of like them too!! It has a wide variety of flavors such as root bear. My grandchildren have enjoyed these very much!! My husband and I have enjoyed as well. I purchased these for Christmas . Haven't opened them yet. Will look pretty in a Christmas dish. I don't know how they do it! The flavor is exactly the same as the food! Good taste either in the jar or by the bag. They have been fresh too. 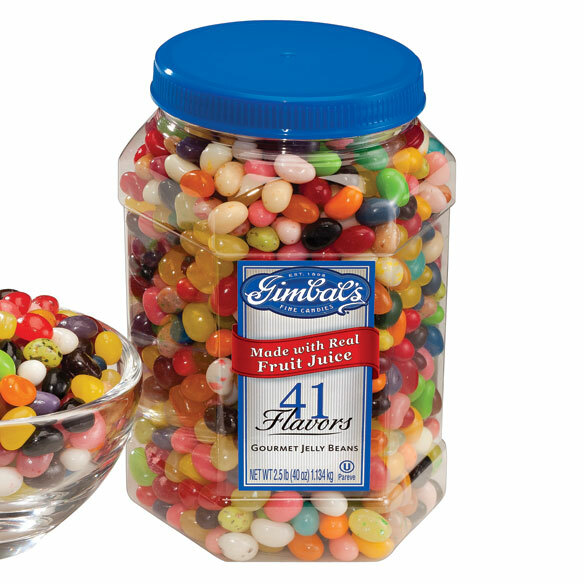 Gimbal's Gourmet Jelly Beans taste as delicious as the well-known jelly bean brand. These are the best jelly beans. What a fantastic snack! These are great tasting jelly beans in a resealable jar. My daughter loved them . I ordered these jelly beans for my daughter for Easter and she really loved them. She loved that their was so many different favors. I LOVE THESE i BOUGHT TWO, ONE FOR A GIFT ON FOR ME. I love these so much I got two jars, One as a gift for my friend! I will be purchasing more of these in the future. Best jellybeans on the market! I used this product as a snack. I truly enjoyed all the new flavors which are not found in regular jelly bean bags. There wasn't anything I did not like about them. I plan on purchasing another jar for Easter. I bought one jar to see if I would like them. I loved them sooooo much that I bought two more they taste so good. My grand kids love them. I put them in there Spring baskets and it was the first thing they went for. LOL. This is definitely something I would buy again and again. And I would recommend this item for sure. They were just like Jelly Bellies, even had the flavors listed. Our granddaughters loved them and I will give them a gift of them at Christmas. The Jelly Belly's were great! it's for easter gift, sorry...to soon to ask. I will buy this item again. My husband and I love the Jelly Beans. Very tasty, lots of different combinations to make. Could eat the whole jar in one sitting. They are yummy, always fresh, and a good bargain! Hard to find good Jelly beans,these are delicious! Open the jar,enjoy all the different flavors! Yum! Sorry the stars aren't showing up! 5 stars! must be good, I bought four. two, then two more! My grandson loves these jelly beans. Wrap a little money a round the jar and it's an instant super gift. And it always fits! These are so close to those famous jelly beans(I will not name).Great flavors,the whole family loves them. I got this for my grandchildren snack on. To be honest I was not sure about buying candy from this site, but I was very pleasantly surprised. I don't qualify as a gourmet taster, but these jelly beans are very tasty and flavorful. I have never been disappointed in anything I have purchased from Miles Kimball and I am happy to say that sentiment continues. This was a good purchase. Every color there is, every flavor you love! I was going to present these magic Jelly Beans to someone for Christmas...forget it! They are mine and never going to leave this house!! I love 'em!!! This was bought to be given as a gift. They are very tasty. The only thing is knowing when you have eaten enough. It is hard to stop. My husband loves these jelly beans..likes to put a handful at once in his mouth so he gets a pop of flavor all at once!!! Love these jelly beans. They are the best tasting. We enjoy these for an afternoon snack. THESE JELLY BEANS ARE JUST AS GOOD AS ANOTHER FAMOUS BRAND. MANY FLAVORS TO CHOOSE FROM AND THEY ARE FAT FREE. Not exactly like Jelly Belly's, but really, really close! These were very fresh and most had good flavors. The price is reasonable. I would buy them again. I believe I ordered 10 of them, there were just 2 that were popped open under the cover. I was surprised to find that out. One family returned it to me, the other questioned it but kept it. Otherwise, I really thought they were a great gift. Not the real Jelly Beans, more sugar, no flavor. My whole family loves jelly beans and this was a great price. Recently ordered this Item and was very pleased with the flavors. These have the best fruit flavor of any jelly bean i have ever tasted,this is my second order for these. I love gourmet jelly beans. They are for my husband. had them before - great ! They are good. Purchased some a while back at Tuesday morning. I LOVE DIFFERENT FLAVORS OF JELLY BEANS. I bought it for a friend. very flavorful , enjoy all the different flavors . Grandchildren love them as well . i love these, great tasting. I remember these from childhood, and wanted to try them again. These are the best jelly beans ever! !